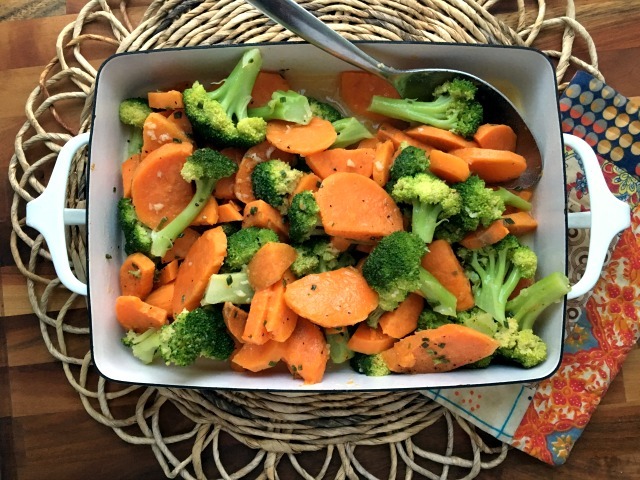 Marinated sweet potatoes and broccoli - a healthy vegetable side dish that goes with everything. The year I lived in France I boarded with a young couple and because I didn’t come home for the Holidays I spent Christmas with them. It was a whirlwind of French traditions as we bounced between events hosted by each of their families. We shared a multi-course Réveillon meal after midnight mass on Christmas Eve, complete with fois gras and roast goose. Then, in what felt like the middle of the night, we drove a few villages away to another family member’s home and after a few hours of sleep the celebrating began again. By the 26th we were so tired of eating and weary of rich food that Marie-France, my landlady, made us nothing but plain rice for supper. Such is the season in Canada too. Then of course as New Year’s approaches it all begins again. If you’re still in party mode but are in search of a healthy, vegetable dish to counter balance an abundance of rich food then this is just the dish for you. 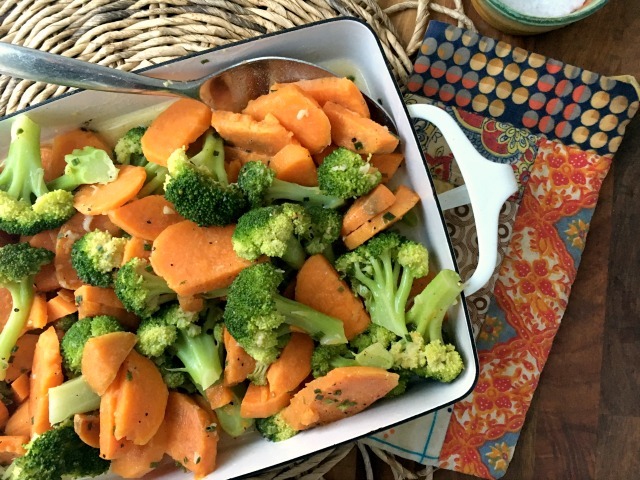 Marinated sweet potatoes and broccoli is pretty, flavourful and can be served as a salad or vegetable side dish. It goes well in a buffet line up too. The recipe is from one of my favourite recipe books, Moosewood Cookbook. Peel the sweet potatoes, slice them lengthwise and then into slices. Set them to cook in a steamer or in boiling water. 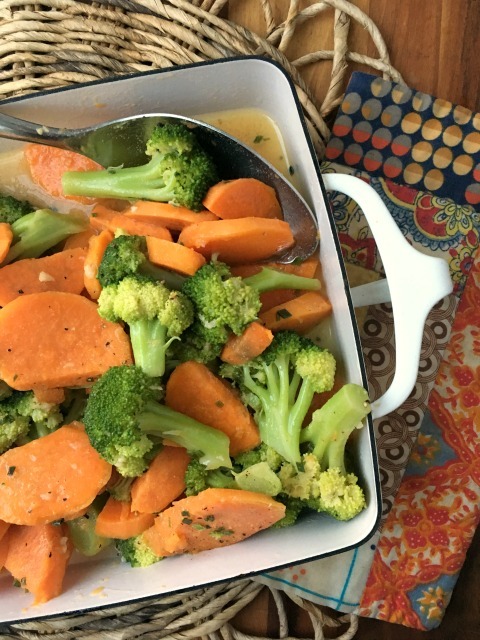 While sweet potatoes are cooking, whisk the marinade ingredients in a large bowl or casserole dish. When the sweet potatoes are just tender, drain and add to the marinade while they still hot. Mix gently. Cook the broccoli until bright green and barely tender. Immediately run it under cold water and drain completely. Carefully place the broccoli on top of the sweet potato. Cover tightly and marinate for a few hours (if you have time). Just before serving gently toss to combine the vegetables and distribute the marinade. Sprinkle over the chives, if using.